Youth Atelier came up with "Banal Town," to raise awareness of the value of a good meal. Photo by Jung Yu-kyung. Having to focus on their studies while dealing with economic difficulties, students are struggling to maintain healthy eating habits. According to a poll taken by Ewha Voice to determine the eating habits of 80 university students, 69.8 percent of the students answered that they only eat two meals per day, 47.2 percent answered that they have a hard time eating three meals a day because they lack the time, and 20.8 percent answered that they use convenience stores for their meals. 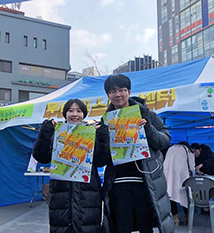 Starting at Sinchon Station Star Plaza on Feb. 16, Youth Atelier created a town with various booths to raise awareness concerning the importance of a good meal. “The first thing university students do when they’re short on money is skip meals,” said Ji Ye-seul, a member of Youth Atelier. Youth Atelier’s aim is to make university students realize their neglect of good meals and provide information to induce voluntary change. Youth Atelier’s booths enabled the participants not only to learn but to maintain healthy life style after participating various booths and events. They also gave advice on how university students can try to eat three proper meals a day. Finally, the two members commented on how eating a proper meal for oneself is another way of self-regard and self-interest.